If you are still worried about how to create an atmosphere. Mirah June Cinema Light Box is the best solution. √ You can change the Lightbox messages as often as you like simply by sliding the letters. 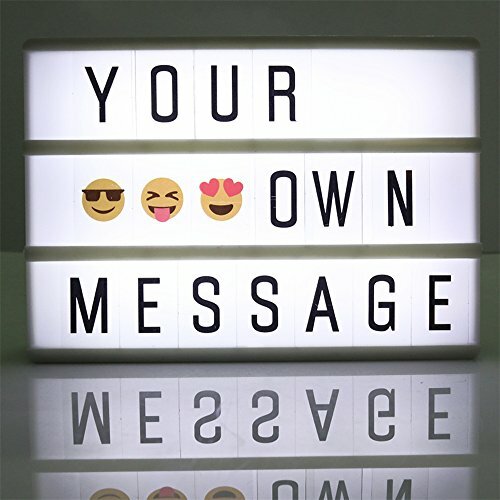 √ This Light box is great for Home Décor, Wedding Décor, Birthday, Love Gift, Celebrations, Movie Nights etc. √ One line can hold up to eight cards, so show your unlimited possibilities in a limited position. √ You can hang it up in your restaurant or store to welcome costumers. √ Use range: wedding decorations, wall decor,interior decoration,outdoor decoration and so on! ❤ Perfect for home decoration, birthday, wedding, Christmas decoration, celebrations, Valentine's day gift, movie nights, etc. If you have any questions about this product by Mirah June, contact us by completing and submitting the form below. If you are looking for a specif part number, please include it with your message.